Since our founding in 2000, we have developed an extensive product line of analog linear servo amplifiers. Our designs incorporate class AB linear output stages for true linear output. Our linear amplifiers include an onboard high-speed DSP that monitors all key systems functions in real time, and provides protection for the output bridge by limiting the power to a “Safe Operating Area”. We offer our LALD series for high precision applications which require ultra-low current drift, in the range of micro amps per degree C.
Introducing our new VLA4 Digital Linear Amplifier. 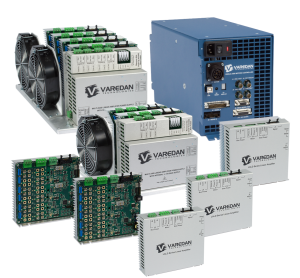 The VLA4 offers Varedan’s existing high performance analog linear servo amplifier technology with our new digital control platform that supports single phase for voice coils or brush-type, ABSine 2phase external commutation for 3-phase motors, internally commutated current mode, velocity or position mode operation. Feedback options include standard incremental quadrature to modern absolute digital systems such as BiSS and EnDat.